WELCOME to the latest edition of the Give Us Wings quarterly newsletter. Please take a few moments to learn about some of the important work you make possible as well as ways you can help Give Us Wings to keep moving forward. There is much to be proud of, and much more work to be done!  * 20th Annual Celebration- April 13! All tickets and tables must be purchased in advance by April 5. 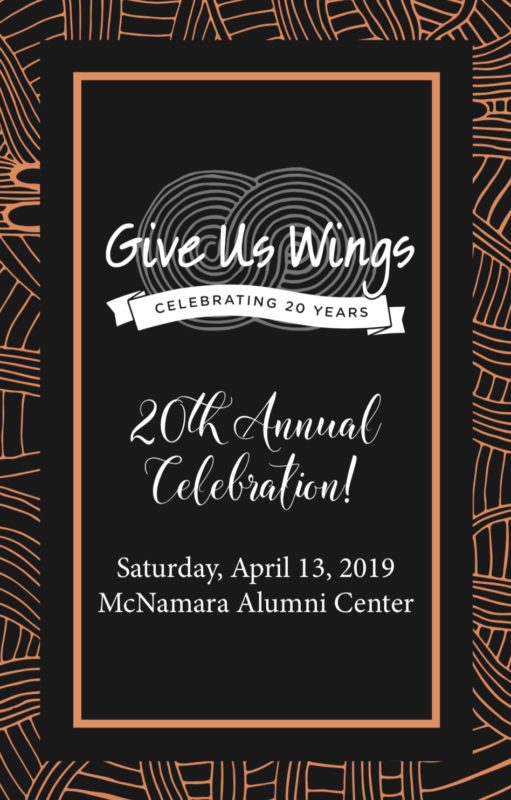 You’ll enjoy a delicious African-inspired dinner, Silent and Live Auctions, our African art boutique, special 20th Anniversary Video, updates on our Family to Family Program, and inspiring keynotes from Mary Steiner and Shawn Whelan, Give Us Wings Co-Founders, and Sarah Muzaki, our Africa Program Director. Alix Kendall, from Fox9, will be back as emcee for her 10th consecutive year. Join us as we take a look back at the history of this organization, and the impact that you and Give Us Wings are making together with the people in Kenya and Uganda! LEARN MORE. 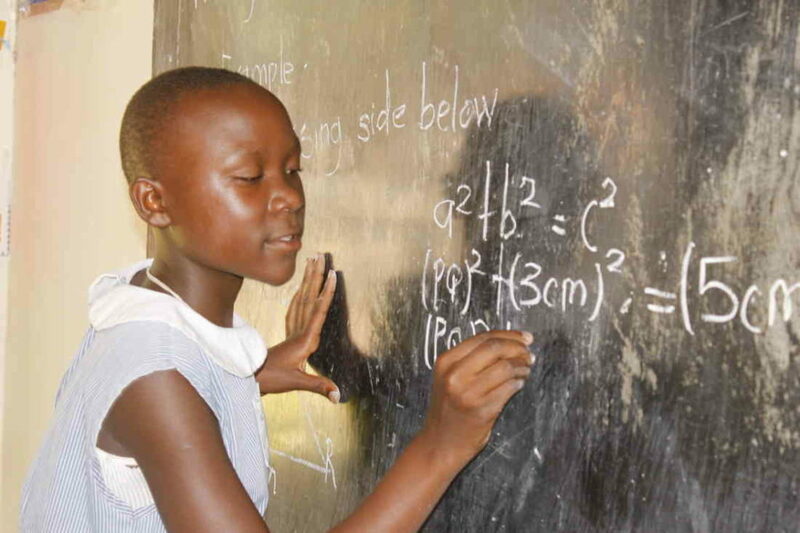 Achieng Flavia, age 13, Primary 7. Flavia and the other children in primary school have now completed their first full school year at their new school, Maama Junior in Malaba, Uganda. It took a little while for some of the children to adapt to boarding school and the academic rigor at Maama Junior. Most of the students are back on track, however, with the support of their teachers, parents, friends, Give Us Wings Uganda staff and devoted sponsors. The children finished Term 3 in early December, went home to be with their families for the holiday break, and returned on February 4 to start Term 1 of the 2019 school year. Overall the children are very happy with their school, and their parents and guardians have been very impressed the quality of education as well as the level of care and nutrition. In addition, there are now 17 students from our Family to Family program who are attending Secondary School. Some of them passed their Primary Leaving Exams in December with such high marks that they were accepted at top Secondary schools! WHAT’S HAPPENING AT ST. JOHN’S KAYORO HEALTH CENTER? 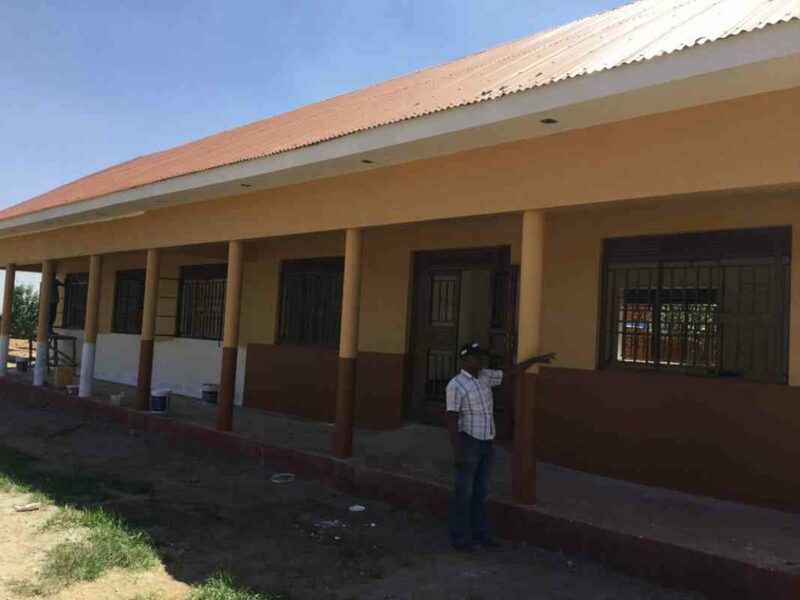 Earlier this month construction was completed on three housing units for clinic staff at St. John’s Kayoro Health Center II (SJKHCII). 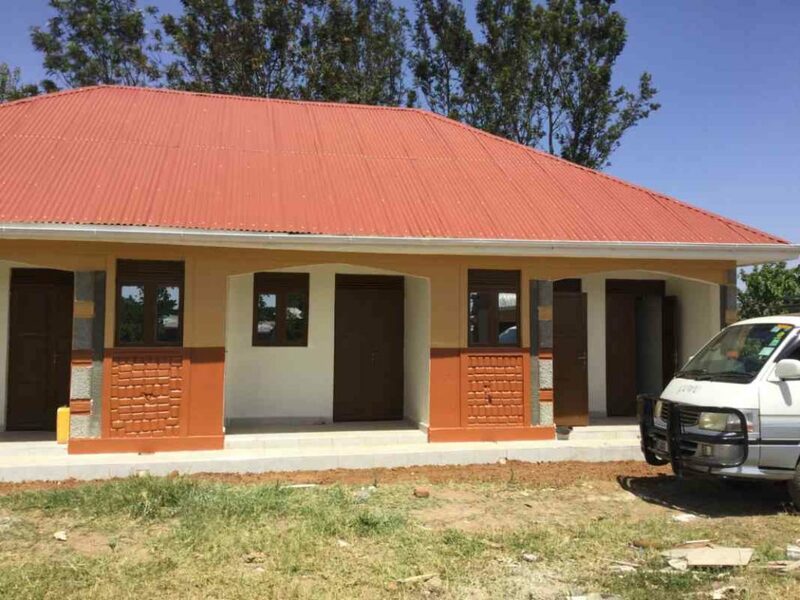 Each unit has a bedroom, living area, kitchen, veranda and bathroom with a flush toilet and a shower! Eventually, the units will be connected to electricity, too. Three staff members will soon move into their new homes and then the clinic will be open 24-hours a day to assist mothers in labor and those with serious illnesses or injuries that require overnight care. Construction on a two-room inpatient ward was also completed this month. This vitally needed expansion was made possible by a generous donation by a Twin Cities family in honor of Give Us Wings co-founders Mary Steiner and Shawn Whelan. Each room will eventually contain 10 beds. Additional rooms for an expanded laboratory, waiting room and examining rooms will be completed when funding becomes available. The clinic’s reputation for providing high quality health care continues to spread and is attracting more and more patients. Recently a judge from Tororo presented for treatment at the Kayoro clinic saying that he made the trip because he “was impressed with the quality of services offered.” He also said, “I will continue to make my way to SJKHCII because of the very high standard of treatment my family and I receive at the clinic. This will be our first choice for medical care.” The clinic continues to treat over 1,000 people every month. What a great night! 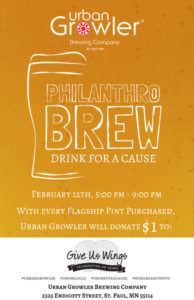 Thank you to everyone who joined us on February 12 at Urban Growler Brewing Company for their PhilanthroBrew benefiting Give Us Wings! A full house enjoyed delicious beer and food, great conversation and awesome live music from Six Still Standing! 135 of Urban Growler’s Flagship beers were enjoyed that night between 5-9pm… so that meant that Urban Growler donated $135 to Give Us Wings! In addition, patrons contributed $505 to our donation jar. Thanks Urban Growler, members of Six Still Standing (who donated their time) and to everyone who came. Let’s do it again sometime! Give Us Wings is pleased to welcome two new members of our Board of Directors. 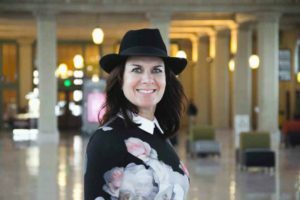 Amy Noble Seitz is Founder, CEO & Chairwoman of Exhibits Development Group and its affiliated companies headquartered in the historic Union Depot, Saint Paul, MN where they will soon open a gallery. EDG is the global leader in cultural exchange for museums. Prior to founding EDG in 2006, Amy had a colorful career with Chammps Entertainment, Carlson Companies, Lintex Corporation, Northwest-KLM Airlines, Steele Foundation, UEG in Copenhagen and AGORA, a retail-design firm she founded in Northfield, MN. She and her husband Christopher restored a 20th century farm house together with their four children, Adam, Riley, Frances and Zoe. 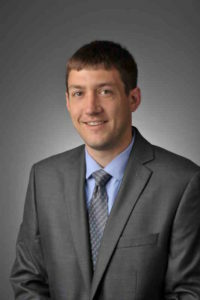 Justin Gervais is a Financial Advisor at RBC Wealth Management, and says he looks forward to working with a team of professionals that are dedicated to carrying out a mission as noble as that of Give Us Wings International.